It's Sunday, the 22nd of May, 2011. In the "news," if you will, yesterday was supposed to be the day of the rapture, judgment day, the end of the world. Personally, it was the end of the world in a sense - the end of a stage of my life in LA. It was also the beginning of my big journey this summer. Let me rewind and give some background: I'll be starting grad school in London in September. Instead of simply traveling to London directly from LA, I'll be traveling the whole summer. First, I'm driving across the US to Miami, and then driving to New York, then taking a bus to Boston. From there I'll fly to Iceland, where I'll spend a week, and then onward to England, and around Europe for a couple months before finally returning to London. I only have vague ideas of where I'll be and what I'll do, but things have already been falling into place and I feel like I'm making a good start. The day started early, and I had been up late trying to pack smartly (which was especially difficult, since I didn't know where I'd end up on this trip). After some goodbyes, I drove to West LA to pick up my travelmate Ueli and to say goodbye to my flatmate. 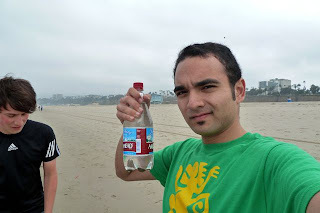 And so the journey began: Our first stop, Santa Monica Beach, where I waded into the ocean and filled an empty water bottle with seawater. The idea was to take this water with me and pour it into the Atlantic Ocean. We then drove to (the Original) Tommy's, where some of my friends were waiting for me to say one last goodbye. I had my Tommy's breakfast sandwich and chili cheese fries, said my goodbyes, and then we headed out of LA. Luckily there was not much traffic. We stopped for gas at a truck stop, looked around for any hitchhikers who needed a lift, but no was there. We stopped in Blythe, the last town in California. Naturally, it was hot. I pulled into a closed gas station and changed into shorts. 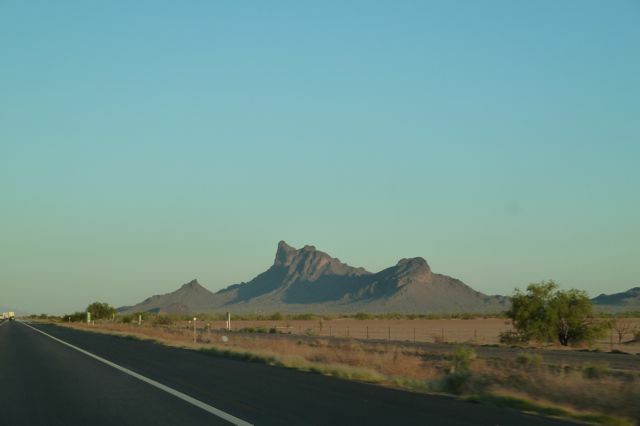 Then we drove into Arizona. About an hour into Arizona, and still an hour or so away from Phoenix, our gas started running low. Still at 15% full, I figured we had a lot of time. Then the low gas light came on. I started freaking out because there was no sign of any civilization for miles around. I slowed down and turned off the A/C to save gas. After about 5 minutes of worry, I saw a building up ahead in the distance. But it was only a rest stop! Another 10 minutes and 10 miles, finally I saw signs for an exit. Tonopah, here we come! We made it and filled up our gas accordingly. Drove into Phoenix. There was traffic, as the freeway was squeezed onto one lane. A bird flew in front of my car and hit it with a noticeable thump. Ueli and I stopped by the state capitol. I initially confused it with a nondescript office building across the street. Drove through downtown Phoenix, and then we drove through Tempe and saw Arizona State University. School's out for summer, so it was relatively quiet, but there are a lot of new restaurants and stores around. Then it was back onto the freeway and onward to Tucson! 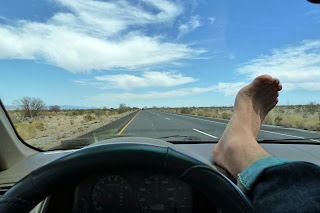 Ueli, who hadn't gotten much sleep, snoozed through most of the drive from Phoenix. I occupied myself with finding radio stations to listen to, since the car has no iPod input. I also enjoyed that Arizona has a speed limit of 75, instead of California's 70 (or 65). The traffic here just seems to move more easily; even big rig trucks go 75-80. Gasoline is also cheaper by about 50 cents per gallon. It was just after nightfall when we arrived in Tucson. We drove straight to our couchsurfing hosts' house, which is several miles off the freeway. I didn't anticipate how large and sprawling Tucson is; it took about 15 minutes driving from the freeway to get to our hosts' house, but they're centrally located in Tucson. We arrived, following directions via text message, and we went for a walk to introduce us to their dog, Crush. Crush is a great dane-greyhound mix, and he can get very hostile towards strangers, which is why we went for a walk first. My first impression of Tucson was how quiet and empty it was. We walked for about 30 minutes, and only 2 or 3 cars drove by us on the street the entire time. It's also really dark - apparently Tucson has anti-light pollution ordinances. Our hosts took us out to dinner, at a local Mexican restaurant in downtown Tucson, near the university. 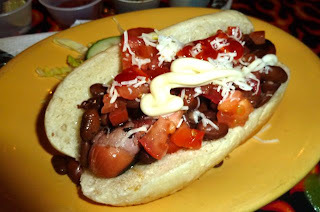 We tried a Sonora dog, which is a bacon-wrapped hot dog topped with beans, tomatoes, salsa, and mayo. Yummy. Then back to the house, and we were all exhausted so we slept.